Successfully Added 4G Car DVR - Android OS, 1080p Camera, Rear-View Parking Camera, 7-Inch Display, GPS, WiFi, Google Play, Quad-Core, G-Sensor to your Shopping Cart. Keep track of anything that happens around your car with this 4G Car DVR system. Not only does this dash cam increase your safety on the road, it also brings the power of Android into your car. With its Android operating system, this car DVR brings along plenty of in-car entertainment. It comes with the Play Store installed and supports WiFi and 4G. Thanks to this, you’ll be able to download Apps straight on to your car media player. 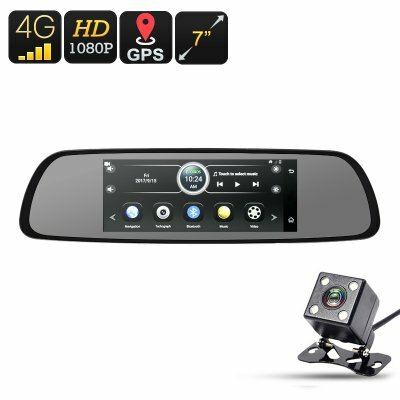 This car accessory comes with both a front and rear camera to give you a great over-all image of what’s happening around your vehicle. The front camera of this car DVR features a 1/4-Inch 5MP CMOS sensor. It lets you record crisp Full-HD footage in 1080p resolution. Thanks to this, you can be assured that you’ll always be treated to highly detailed security footage. With a 160-degree angle, it records all that lies ahead. The remote parking camera of this car gadget also comes with a high-end CMOS sensor. It has a 120-degree angle and produces images at 480p. With this rear camera at your side, you’ll be able to see what’s happening behind your vehicle without needing to turn your head. This will make it a lot easier to park your car and increases the safety of yourself and the people around your car while driving in reverse. This 4G Car DVR supports a 66-channel GPs navigation system. This function allows you to easily find your way to upcoming destinations. From now on, you can be assured that you’ll never get lost again. The car gadget comes with 16GB internal storage and a 32GB SD card slot to keep all your maps, files, and media. With its Quad-Core CPU and 1GB RAM, it is sure to put forth a smooth user experience. To further increase your safety on the road, it supports hands-free Bluetooth calls. When used along with the dedicated mobile application, it even allows you to access your camera from afar. Whether you use it for entertainment or to increase your safety on the road – this car DVR is sure to meet your demands. This 4G Car DVR comes with a 12 months warranty, brought to you by the leader in electronic devices as well as wholesale car accessories..